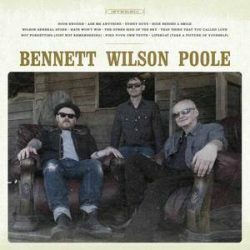 Bennett Wilson Poole’s eleven track debut album has strong vocal and guitar throughout, feeling like the true definition of an americana band. The supergroup made of Tony Poole (Starry Eyed and Laughing), Robin Bennett (The Dreaming Spires) and Danny Wilson (Danny and The Champions Of The World) has a strong Crosby, Stills Nash and Young influence to it, which will take listeners of a certain age back to their younger days. The harmonies and 12 string guitar riffs that display a virtuoso use of the instrument demonstrates the fluidity of their playing and vocals, merging into a sound that although recognisable to many, is unique and gives you the idea that they have played together for many years, when in reality it is their first album. Not to say that this is a replay of oldies – the music is fresh, young and original, especially the opening track and single ‘Soon Enough’. Other songs, such ‘Wilson General Store’, ‘Funny Guys’ and ‘Hate Won’t Win’ highlight the group’s style and class. The final track on the album, however, saves the best till last. At 8 minutes long it serves up the full experience of their musical influences, with the best of their harmonies, very stylish guitar picking and great production values.